My name is Danielle, and if you’ve been following the BIObus blog you may remember me from last summer. I went on a bug collecting adventure to 4 different National and Provincial Parks (Grasslands, E.C. Manning, Gulf Islands and Pacific Rim). Over the autumn and winter months I am a work-study student here at the Biodiversity Institute, and now am once again employed as a full-time summer student. My job normally is officially titled “Imaging Technician”, but I like to think of it as “Bug Photographer”. 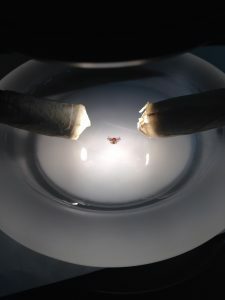 I work to take pictures of our collected specimens, and the highest biomass and diversity we get delivered to our imaging department are insects. They are some of the least observed and known when it comes to taxonomy and species discovery. 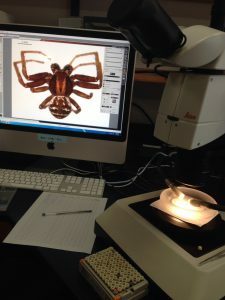 The Biodiversity Institute has been instrumental in discovering new species (especially cryptic species) and a good portion of our collections team are bug experts! We use cover slips to hold the specimen in position for imaging. 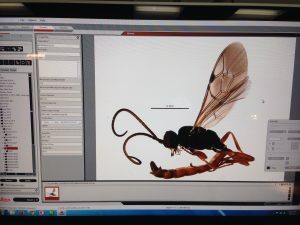 I personally have only a basic working knowledge of insects, but am quite good at imaging specimens, and very enthusiastic about collecting them too. Any insects which are smaller than 1 cm in length are not imaged by regular cameras. Instead we employ microscope cameras which enable us to not only see and take pictures of smaller insects, but to add scale bars to give a size perspective. Unfortunately when you start to get smaller, depth of focus in a picture decreases so we have to take multiple images, in multiple focal points, and then let the computers combine them to create pictures that are completely in focus, high detail and subsequently very informative. It can be very enriching and interesting seeing these specimens in such high detail and magnification. They have a variety of markings, colourations and even hairs that you cannot observe with the naked eye. Hymenoptera especially tend to be the most beautiful (in my opinion). Some will have blue-green or metallic colourations, while others sport blacks and oranges. Often they have fringe wings, and beautiful long curly antennae. They can be more perilous to handle though, as they have very narrow supporting structures between their major body segments which can make them easier to break. My job can also include basic maintenance of our specimen plates, and recently I was involved in helping to ‘top-up’ our older plates with ethanol. Ethanol is the liquid medium we use to help keep our specimens perfectly preserved. The only problem is that ethanol has a high evaporation rate, and even when kept in sealed containers will eventually disappear. We use preventative measures like sealing the rims of containers with parafilm to try to slow the evaporation process, but eventually we need to crack open the older plates and refill them. This summer I will be deployed once again into the field, but until that point, you now have a glimpse into the sorts of things I do! When we think about the most exciting creatures Canada has to offer, your first thought does not immediately jump to the freshwater mussel. That’s what I thought too, until I started learning about them. 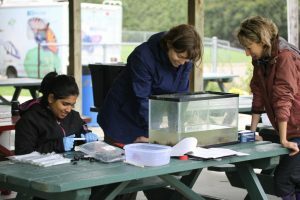 My name is Kareina D’Souza and I have loved animals my entire life, which is why I pursued a degree in Zoology from the University of Guelph. I spent most of my time in Guelph fascinated by sharks, lions and other large vertebrates. The animals I have been historically been intrigued by are bigger and as I used to think, more exciting than freshwater mussels. However, these little animals play a huge part in our aquatic ecosystems. They use their siphons to filter bacteria, algae and other particles out of the water, and are able to filter up to 40 litres of water a day. Their ability to filter helps improve water quality and they also serve as an important food source for many groups including fish, reptile, birds and mammals. They collect toxins in their body, which makes them early indicators of environmental degradation. Unfortunately, this makes freshwater mussels sensitive to pollution and habitat destruction and they are currently the most endangered group of invertebrates in Canada. Out of the 41 species currently found in Ontario, 14 are listed as Species at Risk. In order to collect periostracum, we gently scrape a small area on the outer layer of the mussel shell. In order to help protect freshwater mussels, we must be able to catalog their diversity in water bodies and protect these areas. Currently, mussel surveying is time and resource intensive so new ways of assessing biodiversity are being tested. One new type of assessment is environmental DNA (eDNA) studies to detect the presence of species in an aquatic environment. This approach is effective when a large sampling effort is required to assess species diversity and morphological identification is difficult, as is the case with freshwater mussels. However, before we can use eDNA studies to track changes in endangered populations we must first establish a DNA barcode library. 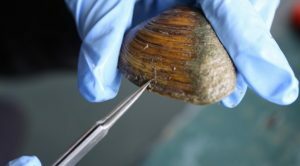 This summer, BIO will be teaming up with several conservation authorities in order to complete the barcode reference library for freshwater mussels. This is no easy task, because freshwater mussels are in substantial decline and in many cases, unable to be collected as voucher specimens. In order to collect the barcodes, we will be using non-invasive sampling which will allow us to collect samples without harming the mussels. Our procedures involve sampling the mussels by collecting periostracum and visceral samples through the use of sterile culture swabs. 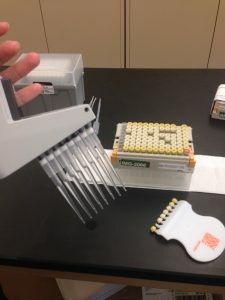 This method allows us to obtain sufficient DNA without harming the mussels or removing them from their environment for more than a few minutes. In a small pilot project in 2014, BIO worked with Kari Jean and Hope Brock at the Ausable Bayfield Conservation Authority to optimize field and laboratory techniques. Our preliminary work on this project has generated barcodes for 50% of the freshwater mussel species in Ontario and we aim to complete the library by the end of the summer. All of the freshwater mussels used for this project will be hand collected from the river and returned once they have been sampled. I’ll be lucky enough to spend my summer in various water bodies in Ontario learning about these amazing creatures and using non-invasive sampling to create a complete reference library for the Barcode of Life Database. Stay tuned for more stories about my adventures in the field!